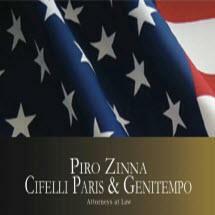 At the law firm of Piro Zinna Cifelli Paris & Genitempo LLC in Nutley, New Jersey, we appreciate how important it is to put a client’s mind at ease after suffering a personal injury, during a family law dispute, or as a result of a conflict with an employer. For decades, we have represented individuals, as well as business and government entities, through issues related to real estate, regulatory compliance, tenancy, corporate and elder law, estate planning, birth injury, medical malpractice, medical malpractice, personal injury, family law, employment and construction litigation. We also provide defense for our clients in municipal court matters such as traffic and parking tickets, DUI, building code and noise violations, minor drug or theft offenses, and simple assault. From the initial consultation onward, our clients feel confident that they have a team of experienced legal professionals on their side. We are a full-service firm; however, our attorneys are not general practitioners. To provide our clients with more knowledgeable counsel and greater focus on their issues, each of our attorneys is devoted to his or her own specific practice areas. In those areas, they keep abreast of recent decisions and current topics in legal thought through participation in professional organizations such as the New Jersey Bar Association and the American Association for Justice. This enables us to bring in-depth understanding to every case we handle, which is part of the reason New York Magazine has honored us as one of the tri-state area’s top-ranked law firms. The Supreme Court of New Jersey has certified several of our Piro Zinna Cifelli Paris & Genitempo LLC team members as civil trial attorneys. Because we prepare every case from the outset as if it were going to trial, we have successfully represented numerous clients in negotiated settlements, as well as in the courtroom. Our law firm works with clients throughout New Jersey and particularly in Passaic, Hudson, Bergen, Essex, Morris, Union and Middlesex, Monmouth and Ocean Counties.